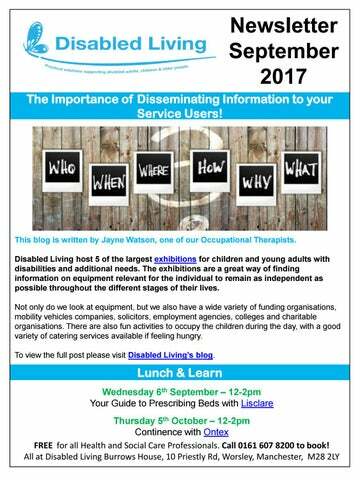 Newsletter September 2017 The Importance of Disseminating Information to your Service Users! This blog is written by Jayne Watson, one of our Occupational Therapists. Disabled Living host 5 of the largest exhibitions for children and young adults with disabilities and additional needs. The exhibitions are a great way of finding information on equipment relevant for the individual to remain as independent as possible throughout the different stages of their lives. Not only do we look at equipment, but we also have a wide variety of funding organisations, mobility vehicles companies, solicitors, employment agencies, colleges and charitable organisations. There are also fun activities to occupy the children during the day, with a good variety of catering services available if feeling hungry. To view the full post please visit Disabled Living’s blog. Disabled Living Blogs - August This month Disabled Living has featured a range of topics on our blog. These include articles posted on Redbank House, Bladder and Bowel UK, and Kidz Exhibitions website. We have a dedicated Inspirational Story of the Month and Lee Kingsberry caught our eye throughout August. You can read how he inspires wheelchair users and creates a positive impact on how they can live their lives. Weâ&#x20AC;&#x2122;ve received a high volume of guest blogs from our Kidz to Adultz Scotland exhibitors including: Cerebra, Safespaces, Swan UK and Theraposture. Other features have explored the benefits of colouring in for children, life with autism by guest blogger, Rebekah Gillian, and the importance of disseminating information to service users. 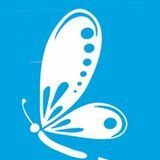 We hope that these blogs help to raise awareness of different disabilities and encourage others to get in touch if they would like to share their story. You can view all of our blogs, past & present here. Get immersed in this complex subject during the interactive sessions. Communication and Resistance Toolkit Here we will be looking at triggers and coping mechanisms, you will build a toolkit to take away enabling you to enhance your work. The Discussion Cafe In Association with Making Space A discussion group centred around Dementia and making the most of life. Using case studies, “Give your healthy brain finding solutions to an experience of what help you work together Dementia might be like” with your person to An immersive enhance their lives. experience. Salford University â&#x20AC;&#x201C; Reducing Falls Risk with State of the Art Walking Frames Researchers at the University of Salford are working to improve walking frames. Walking frames are frequently given to people to help with support and movement, but there is little guidance on how to use them safely. The team at Salford have developed a special, state-of-the-art walking frame. The frame has sensors which measure how balanced and stable a user is. They want to use this frame to improve frame prescription, training and ultimately reduce falls. The team is looking for two groups of people. They are looking for professionals who are involved with walking frames, who could participate in a focus group that will discuss current problems and how to improve frames in the future. They are also looking for participants; older adults who use pick-up or front-wheeled frames, who would like to help. They will be asked to walk short distances with the frame, either in their own home or at the university, and it only takes approximately 1 hour. The smart walker being tested at the University of Salford. Testing the Smart Frame at the University of Salford. If you feel you would like to help, or for more details about the study, contact Alex Bates at a.v.bates@salford.ac.uk or 0161 295 8183. Ableworld Mobility Store at Disabled Living, Salford For your convenience, at the Disabled Living Centre we also have an Ableworld store which sells a wide range of equipment including stairlifts, walkers, scooters, wheelchairs, continence products and smaller aids. The experienced team of staff and engineers has extensive knowledge of the equipment. The store can provide engineering services on site or in the comfort of your own home, within a 30 mile radius of the store. Contact the Salford store on 0161 728 1880 or info@ableworldsalford.co.uk Ableworld has 33 stores around the UK â&#x20AC;&#x201C; Find your local store here. Kidz to Adultz Scotland Thursday 14th September 2017 Royal Highland Centre, Edinburgh, EH28 8NB 9.30am - 4.30pm One of the largest FREE UK events with 80+ Exhibitors supporting children & young adults up to 25 years with disabilities and additional needs, their families, carers and the professionals who support them. Your visitors showguide is now available to download!! Here you can access:•Full timetable of FREE CPD seminars • A full A-Z list of exhibitors • Exhibition Map • Competitions & Prizes • Activity Area Timetable Having the showguide in advance can really help you plan and get the most our of your day! New App – Get Help at Petrol Stations! 13th September - Chunc A representative will be demonstrating their Specialist Wheelchairs. 20th September – FormAlign A representative will be demonstrating their Shower Chair. 4th October – Clos-o-Mat A representative will be demonstrating a range of new products. Learn about the importance of disseminating information to your service users, and more.